Overwatch's Halloween Terror event is back! 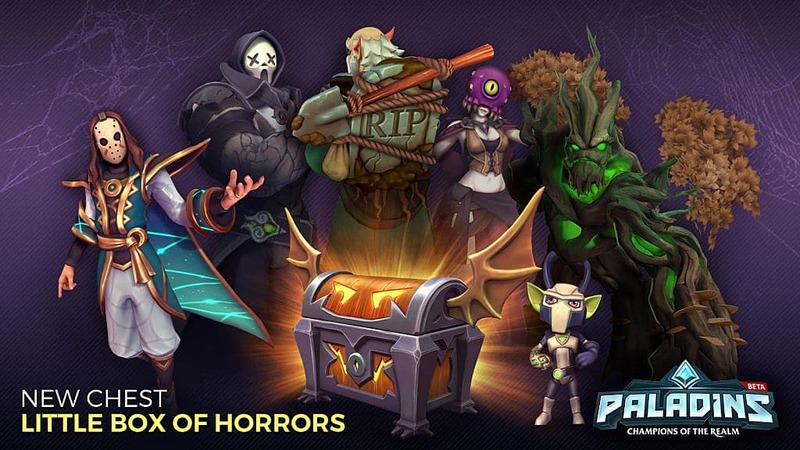 And the best part is that there's even more to it this year, from new skins and new items to Halloween-themed arenas and a brand new game mode. You've got a good while to enjoy this hero-shooter event, too: it runs from now through November 1. Dr. Junkenstein makes his return in Junkenstein's Revenge, and Blizzard added an endless mode for it -- appropriately named "Endless Night"-- to really test your skills as you battle endless waves of enemies fighting to gain entrance into the castle. You can also choose from four additional characters for this mode: Genji, Torbjorn, Zenyatta, and Widowmaker. Alongside that is a brand new leaderboard to record the highest scores and see who made it the farthest. Two maps have received a Halloween makeover as well. 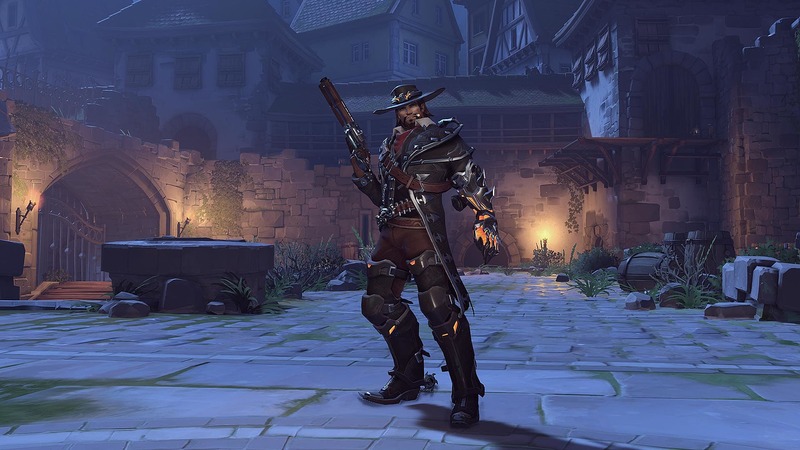 During the event, you can play in spooky versions of the Hollywood and Eichenwalde maps. In true Trick-or-Treat style, there are also Halloween themed loot boxes for you to purchase. 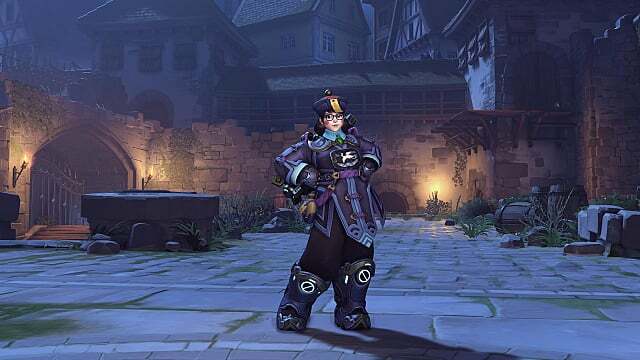 These loot boxes contain a wide variety of things, from new skins and voice lines to avatars, emotes, and even last year's items -- some of which you might have missed. 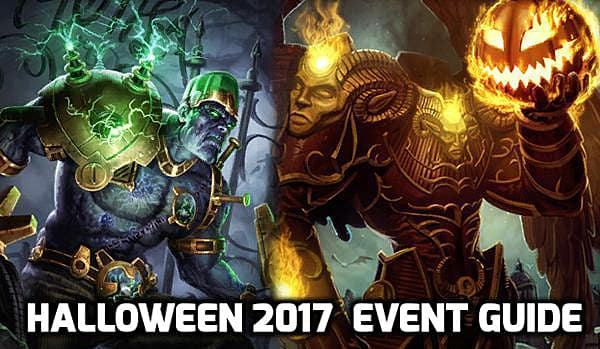 Hi-Rez Studios is offering a Halloween 2017 event for SMITE players, too. It comes in the form of its Departure to the Afterlife event, which is part of the latest SMITE patch, 4.19. It includes plenty of features to help infuse your game with some frightful fun. In addition to the new God skins, the Halloween map makes a return appearance, alongside the Scary Potion. You'll also get some new Halloween chest items, including the Cupid and Thanatos skins mentioned earlier, a Jack-o'-Lantern Jump Stamp, and the Spooky Music Theme. The patch itself includes the return of foul-mouthed announcer Tactless Tina, which may or may not count as frightening, depending on your viewpoint -- and your playstyle. Paladins: Champions of the Realm's treat bucket is full to bursting with the All Hallows Evie patch. There's something for everyone in the Little Box of Horrors chest, from exclusive VIP content and items to new skins for your favorite characters, making this Halloween 2017 event full of scares and delights. 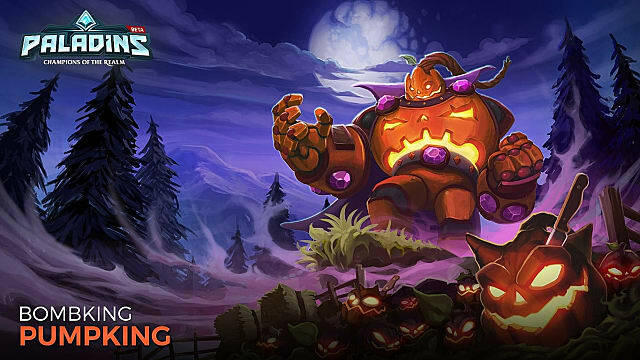 Hi-Rez has included a number of well-designed skins for this Halloween 2017 event, including --finally!-- the tantalizing PumpKing. 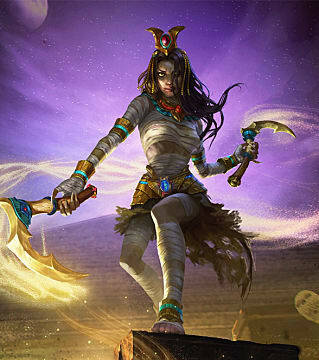 The Strix and Mal'Damba skins are connected to the Harrowing Horrors Quest Line -- which involves paying crystals and defeating a set number of enemies -- so keep that in mind. Strix's outfit is tied to the new "Give 'em a Scare" Harrowing Horror quest (more on that later) and once you unlock his, you can get Ma'Damba's as well. This content is exclusive for VIP members and includes the Bruce Buffer announcer and a special dance for Pip. 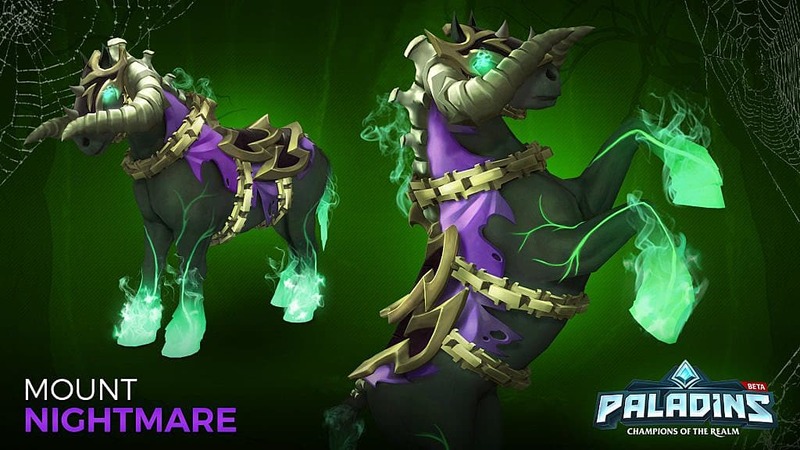 However, you'll also get the Nightmare Mount, a horse with ram's horns --of course-- and green glowing hooves. The Little Boxes of Horror could contain a number of other things, including costume pieces for your heroes or, for some, weapons. Note: All of these are rare. Kakao Games and Pearl Abyss are bringing a unique new crossover and aesthetic to Black Desert Online starting October 18. As the above trailer shows, it centers around mysterious wormholes linking Wonderland to the world of Black Desert -- and, of course, the White Rabbit plays an important role. But so do you: you're enlisted by the White Witch to assassinate the Black Witch. Other Halloween additions include spooky makeovers for central hubs like Velia and Heidel, and there will also be special Alice in Wonderland- themed areas and props, like the Mad Hatter's Tea Party. Of course, it wouldn't be Halloween without costumes, and there'll be plenty of those. The Angelic and Demonic Queen outfits are two notable inclusions, and you can also dress your horse up with the Skeletal Horse Set. Throughout the event, you can wear Scarecrow Masks and Halloween pets Neurotic Cabby and Witch Hat Charlotte make their return this year too. More information is set to come next week when the event starts, so be sure to check back! 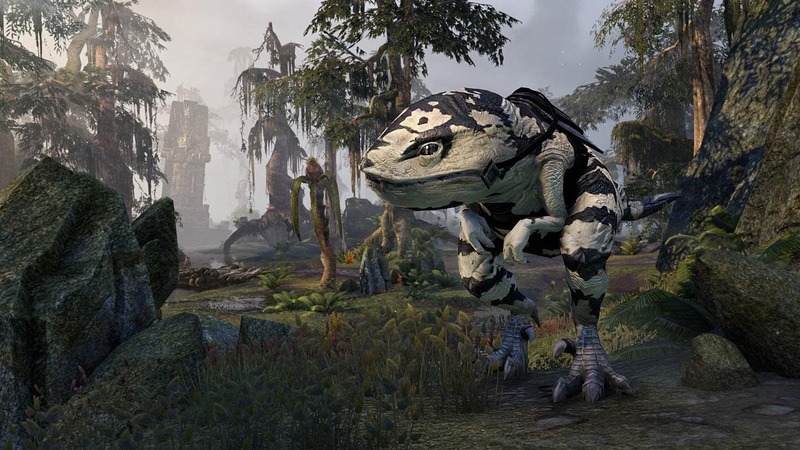 The Elder Scrolls Online Witch's Festival makes its return this year as well, with a glut of new content for you in the Crown Store. However, a good chunk of it is limited to certain periods of time, so make sure to note the dates for your favorites listed below. Note, too, that everything listed is available on all platforms. Like the creepy witch's cottage you see above? It's called the Coven Cottage, and it's for sale from October 19 through November 1. It's allegedly guaranteed not to be haunted...but who knows? 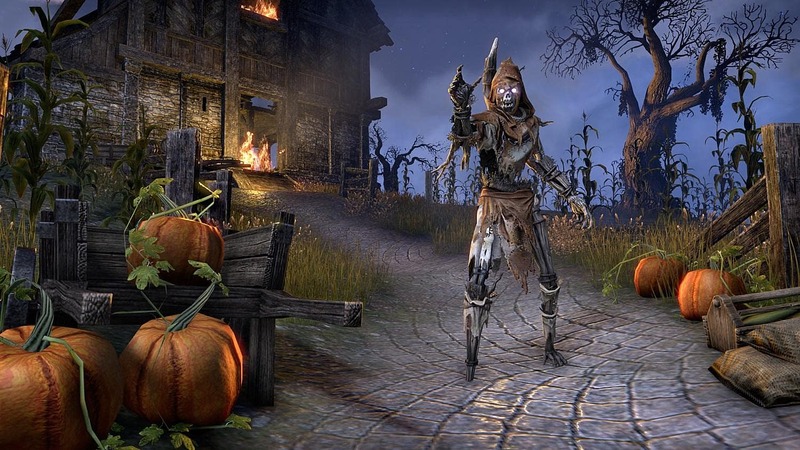 Dressing up for Halloween is the perfect chance to play around with a new personality, and Halloween in ESO is no exception. Call of Duty: WW2 might be coming out soon, but that doesn't mean you can't still enjoy the series' latest offering in the meantime. Willard Wyler's Halloween Scream is back, with some frightful extras to help spook out your game. Starting Friday the 13th, you can re-challenge select bosses from the zombie campaigns. Do note that you have to own the respective DLC packs in order to access these battles. The event also features the return of fan-favorite Carnage DLC map, along with double XP. This one lasts until November 1. If Overwatch or SMITE just aren't your favorite, you'll be happy to know Epic Games' Paragon Shadow's Eve event is now live. 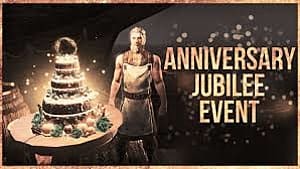 It brings several new skins and banners, in addition to the return of some old favorites, and the event runs until November 1. There are three new banners, featuring the three new skins, you have a chance of winning in a chest after each match. Each chest also gives you the chance to win one of the new or older skins, alongside the usual keys and tokens. The in-game store is also running a 25% discount on these additional Halloween skins. Be sure to check back for more details as they come in. For now, let us know in the comments which of these you're playing or planning on playing! Sandbox fans aren't left out of the Halloween fun either! Mojang's server partners are running several different Halloween events from Friday 13th (quite appropriately) until October 31st. From trick-or-treating to fleeing from zombies, there's plenty to keep you in the Halloween spirit. The lobby received a Halloween makeover, featuring pumpkins, glowing green goo, and spiders, but there's more lurking in the dark than the eye can see right away. You'll need to keep an eye out for a tiny skeleton wandering around the lobby, and if you catch him, you receive a cave spider zombie jockey as a pet to accompany you until Halloween. But beware: the hunter can easily become the hunted. Zombies prowl the lobby, looking for their next snack. However, you can always take a break and enjoy the Haunted House parkour course too--if you dare. There are changes afoot in the lobby here too. The entire lobby has taken on an eerie Halloween-themed neighborhood look, complete with spooky skins for your characters. Get your skin from the Jack-o-Lantern by the spawn point, then head over to the house for your treat--but be prepared for tricks too. You can also bring along one of the limited time DLC pets, including blaze, wolf, or mooshroom, among others. 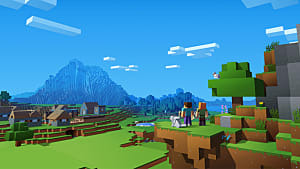 On top of that, you can play the Halloween themed SkyWars map, where every island is a grave, and you have to keep on your toes to ensure it isn't yours. The Mineplex event is all about rewards. The Pumpkin King has arrived, and he brings with him an assortment of quests, each with their own rewards, on a three hour basis. There are also flaming pumpkins that will randomly appear in games, each offering prizes to those who smash them, from gems and keys, to Top Rank. This one has its own limited time DLC too, in the form of trick-or-treat boxes you can gift to your friends (or hoard for yourself). 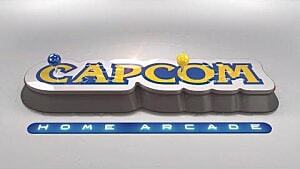 They contain lobby effects, potions, costumes, and food. What happens when zombies and killer zombie raykins invade your neighborhood? Well if you want to know, check out the Trailer Park Boys Halloween event, running until October 20th! 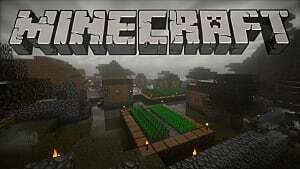 Take down the zombie horde before they become out of control, and seek out the source of the creeping plague by taking on the evil raykins. Depending on your performance, you may just unlock a raykin for your wrestling arena too, which boosts profits for your ring. Rocket League''s first ever Halloween event is here! It runs until November 6th at 10am PST, and it introduces a brand new form of currency for a limited time: Candy Corn. 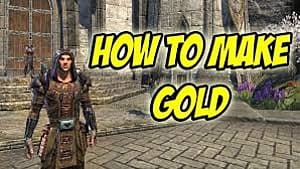 You'll be using this throughout the event, so here's a short guide to help get you started. Candy Corn is your spendable reward that you use to purchase Haunted Hallows Crates, alongside Decryptors and other Halloween items. You receive Candy Corn as a reward for completing an online match, so it's a simple and intuitive system. Your Candy Corn will disappear one week after the event ends, but everything you purchase with it remains in your inventory, including crates. To spend your candy, click the Special Events button on the main menu, and go from there. What Can I Get with It? The Haunted Hallows Crates are your the main draw for spending your Candy Corn, and they contain a variety of items for your Halloween enjoyment. These items are separate from the ones you can purchase in the event store as well. However, you can also purchase Decryptors with Candy Corn, Decryptors are a new way of unlocking crates in Rocket League and, for now, can only be purchased with Candy Corn. Be sure to note that crates unlocked with Decryptors cannot be traded. There are two other ways of obtaining Haunted Hallows crates. 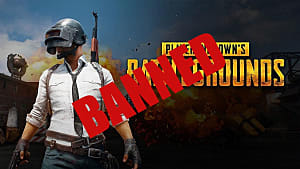 One is through regular online play; there's a chance a crate will drop at the end of each match. The other is through purchasing them directly, with real-world money. 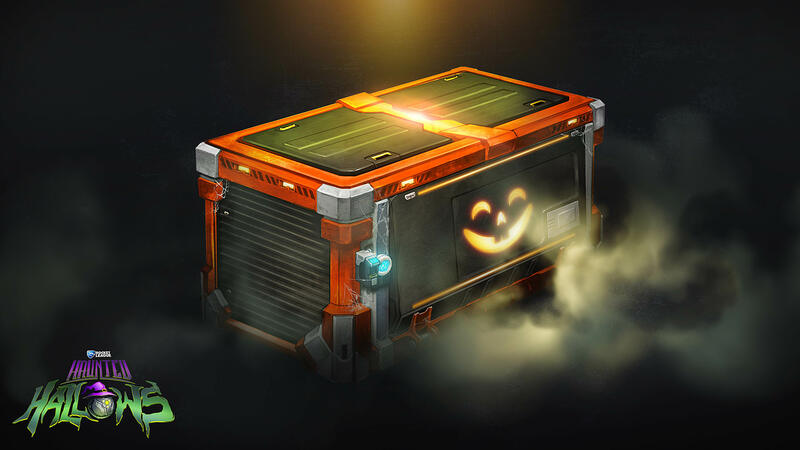 However, like crates unlocked through Decryptors, Haunted Hallows crates bought with money cannot be traded. The crates won't be updated for next year either, which means you can wait an entire year to open them, if you so choose. The Mad King returns in Guild Wars 2 for yet more Halloween mayhem! 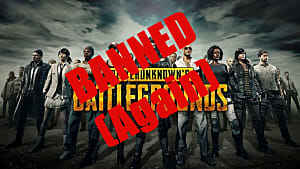 The event brings with it numerous spooky diversions for your gaming pleasure, from battles to puzzles and more besides! Face off against the Mad King himself--Oswald Thorn. Study his tactics carefully if you want a chance for survival. But be careful--you never can tell what a madman might do next. Race your way to the top of the crumbling, haunted clock tower. Mind your step as you go, because one wrong move sends you tumbling into the rising tide of horrors below. 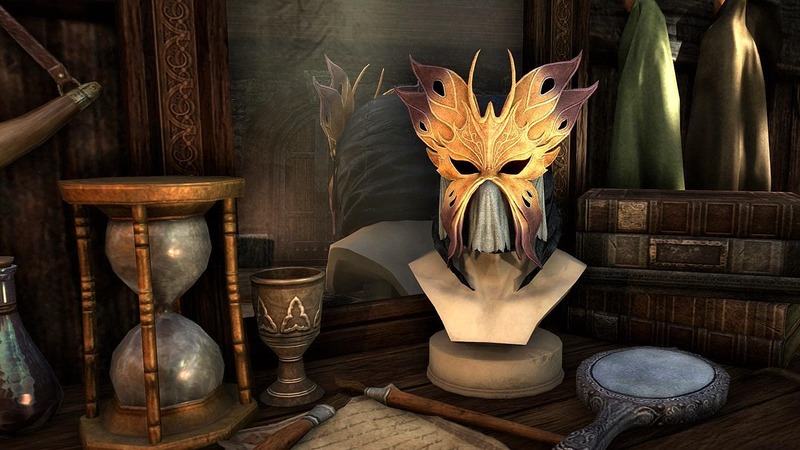 Drink in the Halloween atmosphere at the creepily bedecked Lion's Arch, and you might even have Oswald Thorn himself drop in for a game of Mad King Says. But of course, it wouldn't be Halloween without treats, and there are plenty to go around, including Halloween skins, weapons, and armor. Niantic finally announced what dataminers already discovered: Halloween introduces Generation III Pokemon from Ruby and Sapphire! The event runs from October 20th at 12pm PST to November 2 at 1pm PST. As in previous years, there will be higher chances of finding the returning spooky Pokemon, including Houndoom and Gengar, but you'll also get to catch Gen III's Ghost types as well--Duskull and Dusclops, Shuppet and Banette, and Sableye. 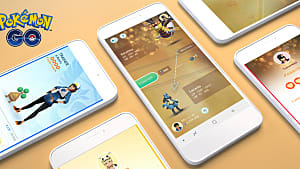 And, starting in December, Niantic will be slowly rolling out additional Hoenn Pokemon, though which ones and when specifically have not yet been stated. However, you'll also want to be on the lookout for the special witch-hat-wearing-Pikachu seen in the trailer. Special boxes are on sale too, with items including Raid passes, Super Incubators, and, of course, candy. 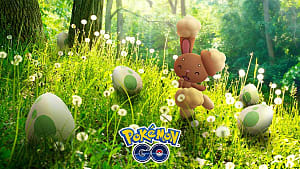 Pokemon will be earning twice as much candy as normal during the event too. There's also a Gen VII surprise in store, in the form of a Mimikyu hat you can get for your avatar. Fans of Clash of Clans won't be surprised to hear that Supercell appears to be gearing up for yet another seasonal event. Details aren't confirmed as of yet, but here's what seems to be in store. Supercell is introducing two new troop types: Pumpkin Barbarian and Giant Skeleton Troop. The Pumpkin Barbarian is a regular Barbarian dressed up as a pumpkin and with an extra shield -- a pumpkin shield, of course. Don't let the images you might have seen fool you either. The Pumpkin Barbarian doesn't have low HP; that's just for the shield. The Giant Skeleton has its own unique characteristics that actually encourage you to let it get defeated. It carries around a giant explosive that goes off when it dies. It can even destroy structures like spell factories. This year's Halloween obstacle is a baby dragon skull. Like other obstacles before it, it costs 25k elixir to remove and gives you 75k in return. We'll post more as it becomes available, so check back soon! There are some new Halloween skins on sale in the store too, purchasable with V-bucks. All of this is part of the much larger Fortnite update out now, and here are the details about it. There are two types of leaderboards too, and they all automatically reset on Wednesday of each week. 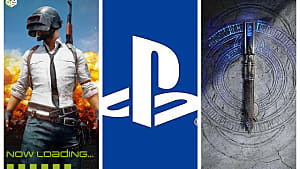 These are based on different groups, or divisions, of players. 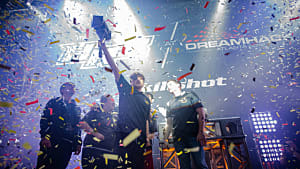 Each division is made up of 50 players competing against each other. Players are automatically assigned to new divisions each week. Each match type gets its own division. Compare and compete with your friends by turning on "friends only" on the board settings. 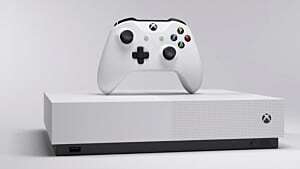 PlayStation 4 and Xbox One players who own a microphone now have the option for team chat in their games, and it's a default setting. PC players have voice options too--added in the last update--but they need to push talk to activate it, and it's bound to the Y key. Chat isn't mandatory, though, and can be deactivated in the Audio Options menu. 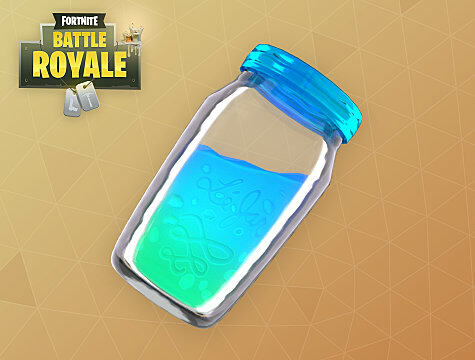 This consumable item is a major new piece added in the update. It grants the user one health and one shield per 25 seconds and can restore your health all the way up to 100. 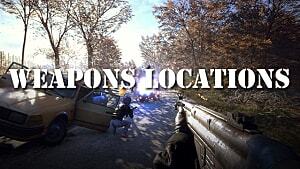 You'll find them in the same areas where you find other consumables, and you can also stack up to 2 of them. These seasonal perks are a way to help level up your character and get exclusive items into the bargain. The first level gives you the ability to raise your character to 100 and displays your level in your banner. It also adds banner flair from levels 2-49 so you can display your prowess for all to see. 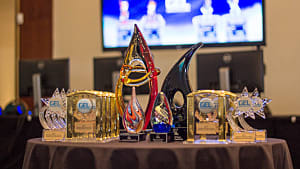 There are two seasonal awards for progressing through the first season as well. Daily challenges are the way you raise your seasonal experience points, with a new one provided every day and the ability to have up to 3 active at one time. It wouldn't be Halloween without Hearthstone! The Hallow's End event is back, and the Headless Horseman is your master of ceremonies. He's taken control of the tavern, which you'll find has been remade to match the seasonal mood, but there's more to the event than just that. Once each week during the Halloween spectacular, the Headlass Horseman will be handing out card packs and an Arena ticket. Log in before October 30 at 10:00 pm PDT to receive two Whispers of the Gods packs and an Arena ticket. Log in between October 31 at 12:01 am PDT and November 5 at 10:00pm PDT to recieve two Knights of the Frozen Throne packs and an arena ticket. There's a brand new dual-class Arena match for the duration of Hallow's End too. 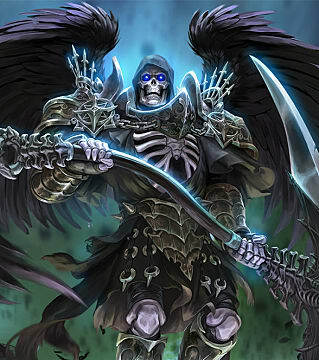 Each Hero is wearing a special Halloween costume; you'll choose both a Hero and a Hero Power and then receive cards from both classes, alongside your neutral cards. Don a costume and travel throughout the countryside to find the Headless Horseman and put an end to his tricksy deeds. What costume you'll wear is Discovered once the Brawl begins, and each costume has its own deck featuring cards from across the classes, plus a passive Hero Power. Sloclap and Devolver Digital released Absolver's latest update recently, which includes new seasonal gear, among other updates and accessories. Your 1v1 Combat Trials matches can now take place at night, but more importantly for some players is the fact that all 6 Marked Ones are sporting Halloween masks--Halloween masks that can be dropped upon your victory. You can check them out in the trailer above. There are a couple of other important inclusions in the update. 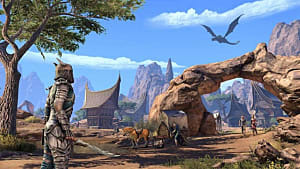 One of them is the Prestige system, which lets you advance your Absolver beyond level 60 and provides additional subsystems to help you grow them even further. Each level gained nets you a Crystal, which you can use to reset attribute points. The random loot drops from Combat Trials have been replaced with Rift Disks and Rift Coins, items that can be traded for rare gear. You also can acquire Rift Disks by trading in Crystals. There's a new, more intuitive inventory management system included in the update too. And the other major addition? You can now be bald.